Addison County was formed, in 1785, from a portion of Rutland County, Vermont. Select from the TOWNS List below to view information and links specific to each town. Select from the menu below to see GENERAL Addison County information and links. Ø Addison County Vermont Cemetery Indexes. Ø Index to 1790 U.S. Census Vermont Info. - Note: Vermont joined the Union in March, 1791, so its 1790 census was actually taken in 1791. At that time, Vermont consisted of 7 counties. Present-day counties were later formed from all or portions of these seven counties. Ø 1790 U. S. Census of Orange County, Vermont Towns which were soon to become part of Caledonia County when formed, in 1792, from Orange County, (includes towns which came to be within the counties of Caledonia, Essex, Orange, Orleans and Washington) abstracted by Jim Dresser, dedicated Town Coordinator for Groton, VTGenWeb. Thank you Jim!!! Note: This census of Vermont was actually taken in 1791. Ø Online book: Statistical and Historical Account of the County of Addison, Vermont, by Samuel Swift, Middlebury: A. H. Copeland, 1859. Ø Online book: History of Addison County, Vermont, edited by H. P. Smith, D. Mason & Co., Publishers, 1886. Ø Online book: History of the Town of Shoreham, Vermont: From the Date of its Charter, October 8th, 1761, to the Present Time, by Rev. Josiah F. Goodhue and Samuel Swift, [ca. 1859]. Ø Henry Sheldon Museum of Vermont History: 1 Park Street - Middlebury, VT 05753; Phone: (802) 388-2117.
o "Rokeby Museum presents a nationally significant Underground Railroad story . . ."
Ø Would you like to post a query related to Addison County, Vermont? 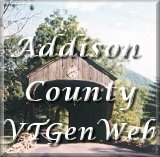 Visit the Rootsweb message board for Addison County, Vermont. Located in west central Vermont, Addison County TOWNS/TOWNSHIPS are listed in bold print below. Villages and communities within each town follow the town's name, in normal type. ADDISON - Addison, West Addison. BRIDPORT - Bridport, West Bridport. BRISTOL - Bristol, Rocky Dale. CORNWALL - Cornwall, West Cornwall. FERRISBURGH - Basin Harbor, Ferrisburgh, Ferrisburgh Station, North Ferrisburgh. 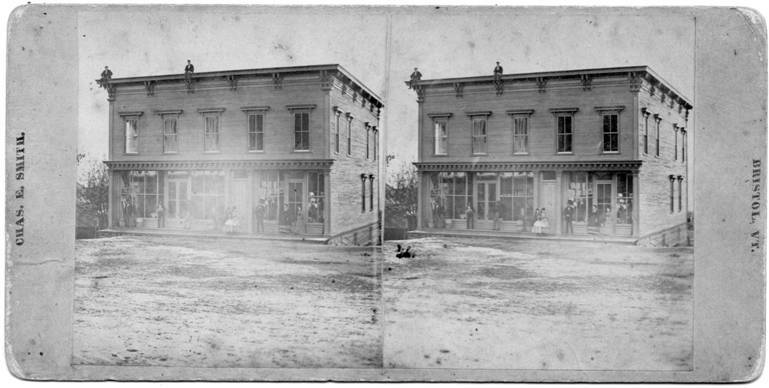 GOSHEN - Goshen, Goshen Four Corners. GRANVILLE - Granville, Lower Granville. LEICESTER - Leicester, Leicester Junction. LINCOLN - Downingville, Lincoln, South Lincoln, West Lincoln. MIDDLEBURY - East Middlebury, Middlebury. MONKTON - East Monkton, Monkton Boro, Monkton Ridge. NEW HAVEN - New Haven, New Haven Junction, New Haven Mills, Beldens/Beldens Falls [ historical] and Brooksville [historical]. SALISBURY - Salisbury, Salisbury Station, West Salisbury. SHOREHAM - Shoreham, Shoreham Center. STARKSBORO - Rockville, South Starksboro, Starksboro. WEYBRIDGE - Weybridge, Weybridge Hill. Ø Addison Probate Court: 7 Mahady Court - Middlebury, VT 05753; Phone: (802) 388-2612. Ø Addison Town Historical Society: Old Town Hall - Addison, VT 05491-8732; Phone: (802) 759-2380.
o Mailing Address: 7099 VT Route 22A - Addison, VT 05491.
o Mailing Address: RR 1 - Box 656 - Bridport, VT 05734; Phone: (802) 758-2654. Ø Bridport Town Clerk: P.O Box 27 - Bridport, VT 05734; Phone: (802) 758-2483.
o Howden Hall Community Center - Main Street - Bristol, VT 05443. Ø Bristol Town Clerk: 1 South Street (mailing address: P.O Box 249 - Bristol, VT 05443); Phone: (802) 453-2410. Ø Cornwall Town Clerk: Cornwall, VT 05753; Phone: (802) 462-2775. Ø Ferrisburgh Historical Society, Inc.
Ø Ferrisburgh Town Clerk: 3279 Route 7 (mailing address: P.O Box 6 - Ferrisburgh, VT 05456); Phone: (802) 877-3429. Ø Goshen Town Clerk: 50 Carlisle Hill Road - Goshen, VT 05733; Phone: (802) 227-6455. Ø Granville Town Clerk: Granville, VT 05747; Phone: (802) 767-4403. Ø Hancock Town Clerk: 48 VT Route 125 (Mailing address: P.O Box 100 - Hancock, VT 05748); Phone: (802) 767-3660. Ø Leicester Town Clerk: 44 Schoolhouse Road - Leicester, VT 05733; Phone: (802) 247-5961.
o Mailing Address: c/o Town Clerk, Lincoln, VT 05443; Phone: (802) 453-3628. Ø Lincoln Town Clerk: 62 Quaker Street, Lincoln, VT 05443-9253; Phone: 802-453-2980.
o Addison County Vermont Cemetery Indexes. Ø Ilsley Public Library: 75 Main Street - Middlebury, VT 05753; Phone: (802) 388-4095. Ø Middlebury Town Clerk: 94 Main St. - Middlebury, VT 05753; Phone: (802) 388-8100.
o Mailing address: P.O. Box 12 – Monkton, VT 05469; Phone: (802) 453-3800. Beldens (aka Beldens Falls) and Brooksville were located in southern New Haven township, north of Middlebury. Ø New Haven Historical Society - and brief Town History. Ø New Haven Town Clerk: 78 North Street - New Haven, VT 05472; Phone: (802) 453-3516. Ø Town Lotting Plan Map of Orwell, Vermont, from a photographic copy of a map traced by F. H. Dewart, 1923, from the town clerk’s original parchment plan of Orwell as decipherable. Ø Orwell Town Clerk: 436 Main Street – Orwell, VT; Phone: (802) 948-2032. Ø Panton Town Clerk: 3176 Jersey Street - Panton, VT 05491; Phone: (802) 475-2333.
o Map of Ripton Cemeteries. Ø Ripton Town Clerk: Ripton, VT 05766; Phone: (802) 388-2266.
o Addison County Cemetery List and Indexes. o Kirby Cemetery, Ripton, Vermont, by Fletcher Brush (offsite). Ø Biography: Ann Story - born in Preston, Connecticut in 1741, Ann died in 1817, in Middlebury, Vermont. A monument to commemorate her service to the Green Mountain Boys for the independence of Vermont stands in Salisbury. Ø Salisbury Town Clerk: 25 Schoolhouse Road, Salisbury, VT; Phone: (802) 352-4228.
o Village Cemetery, Salisbury, VT, by Fletcher Brush (offsite). o Holman Cemetery, Salisbury, VT, by Fletcher Brush (offsite). o West Salisbury Cemetery, Salisbury, VT, by Fletcher Brush (offsite). Ø Online book: History of the Town of Shoreham, Vermont: From the Date of its Charter, Octoer 8th, 1761, to the Present Time, by Rev. Josiah F. Goodhue and Samuel Swift, [ca. 1859]. Ø Shoreham Historical Society: Route 22-A - Shoreham, VT 05770; Phone: (802) 897-2600. Ø Shoreham Town Clerk: 297 Main Street - Shoreham, VT 05770; Phone: (802) 897-5841. Ø Starksboro Town Clerk: 2849 VT Route 116 – Starksboro, VT; Phone: (802) 453-2639. Ø Bixby Memorial Library: 258 Main Street - Vergennes, VT 05491; Phone: (802) 877-2211. Ø City of Vergennes - The oldest city in Vermont - 1788. Ø Vergennes Town Clerk: 120 Main Street – Vergennes, VT 05491; Phone: (802) 877-2841. Ø Waltham Town Clerk: 2053 Maple Street – Waltham, VT 05491; Phone: (802) 877-3641. Ø Weybridge Town Clerk: 1727 Quaker Village Road – Weybridge, VT 05753; Phone: (802) 545-2A50. Ø Whiting Town Clerk: 29 South Main Street - Whiting, VT 05778; Phone: (802) 623-7813.